Michael Earl Craig I love you for a number of reasons: (1) you are a poet I can admire cause you hold horses' feet on a weekly/yearly basis. This is more than okay with me. If I had a stronger back, maybe I could do this line of work too & I respect it cause it's hard work. I would know knowing horses. Livingston, MO is a place I feel I'd love & you live there. I wonder if you've met Jim Harrison or Russell Chatam or any of those ole wild men. (2) your poems / YOUR POEMS. Your poem "Advice For The Poet" does just what it says. Here it is in total: "Never aim your bicycle at a chicken. / Never set your glasses on an anvil." This is sound poet-to-poet info here. In the poem, "I Was Thinking," in the first section, you write: "I thought: It's Wednesday, I'm / gonna get me a belt buckle with / a bald eagle on it. / The wind chimes went batty." This makes me happy as well. All of your books make me happy & so here is your fan mail from me, Shelly Taylor, for NAPOMO. Thanks! And salud! squinting, so too does the spadefoot. He is surrounded. of this. Then everyone gets tired at once, and night is quiet. It is now that the spadefoot works his little leg. by the window, which somehow holds for me all of Evening. someone left on a fencepost. Each drop comes tapping the garden. A mudslide occurs and the spadefoot is swept away. You could say I rode a tall horse. You could say I rode a long black horse. In reality I'd never even touched a horse. I drove by them all the time. that dreamt with their heads down. to even glance at a horse. he was young and was kept apart from other horses. to get over to the other horses. For horses are herd animals. Horses easily die of loneliness. This young grey horse seemed to be doing this. and about thirty-two when I finally pulled over and parked my car. to get to the barbed-wire fence where he stood. He was quite old, sway-backed, bad teeth. in a kind of left-to-right figure eight. as I approached him in his pasture. All the other horses were in a distant pasture. on the yellow hillside. I reached the fence. I was finally standing not three feet from this horse. I reached over the top strand of wire. as if he'd known me all his life. I am one of the world's largest assholes. You are a farrier. "One who shoes horses." But you never explicitly write about shoeing horses, I don't think. 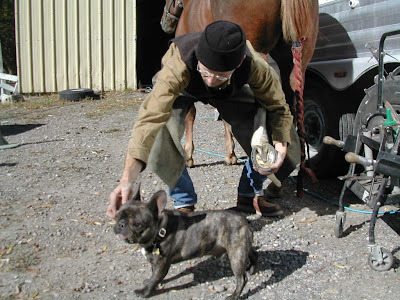 Is shoeing horses a passion for you? Or do you do it for the money? Can you write a five word, two line poem about being a farrier? Go look at the poem called I RATTLED OFF TO WORK TODAY in new book. That may not be “me,” but that’s how time usually moves for me (and that is definitely my pickup). Yes, shoeing is a passion. It's very challenging and rewarding work. I have to run a business, be good with people, be good with horses, understand equine anatomy, and work well with my hands. Most of the tools used daily are tools that have been in use for hundreds of years. In many ways it’s very primitive. I’m like a caveman, really—stooped over, smeared with horseshit and urine, blowing farmer snots next to the customer’s Navigator, just looking for my next Ibuprofen. But what exactly is the caveman up to? Well, to summarize: I'm carefully trimming and sculpting the horse’s foot with nippers and a rasp while holding it between my knees (not kidding). Then I look at it carefully, take a few measurements, and go to the anvil to shape an inanimate object (horseshoe) to fit this horse's foot. I use a forge so the metal is extremely hot and has to be handled with tongs. After a few trips, making sure the shoe fits, I quench it in water and take a small hammer named Rick and nail it (shoe) onto the horse's foot while he/she stands there on 3 legs, quietly or not. But yes, I also do it for the money. There is no money in poetry. Brief poem you asked for: Fondling my clinch / block, wondering.